Chinese Economic Data Shakes the Equities Markets – Part II – Technical Traders Ltd.
As we continue to explore the fragility and future implications of a Chinese economic contraction from PART I as well as the broad extent such a contraction may have on global markets. Our continued premise is that a renewed capital shift is taking place that focuses on US Blue Chips and Mid-Cap stocks. We believe this is currently facilitating a renewed valuation exploration process in the US and global markets and, as such, may result in expanded price exploration for many global markets. Credit, debt and equity crisis events typically unfold in one of two forms; orderly or disorderly. Our belief that an orderly credit/debt crisis event is currently unfolding in China/Asia and Europe is based on the premise that the Chinese economic data may have been grossly inflated over the past 9+ years and that the extended credit boom in China/Asia may be similar to the 2008-09 credit crisis experienced in the USA. When a credit boom takes place, a vast majority of this new credit enters the global market as private, corporate and government debt. When a credit contraction event takes place, this credit/debt become a massive liability which can ultimately destroy future capabilities. One aspect of the total Chinese credit/debt ratio to consider would be the GDP Deflator values. These ratios compare non-inflation adjusted GDP to inflation-adjusted GDP. As inflation increases, the difference between Nominal GDP and Real GDP are related in the GDP Deflator values. Currently, the Chinese GDP Deflator values are reporting at 656% for 2017 – which indicates the year over year inflation is running at 656% from the base year. We believe this inflation measure may actually be much higher in 2018 and would indicate that consumer inflation continues to skyrocket in China while credit/debt issues are becoming more prominent. Consider the implications for consumers, corporations and the Chinese government if inflation continues to increase while consumers, corporations and government are becoming more and more distressed with debt issues. The most logical outcome would be a devaluing of the Chinese currency or the forgiveness of certain debt issues, yet we believe the problem is much more systemic in China/Asia. We believe the core issues China is facing is the reality of their own making. The reality that the manipulated growth and expansion they have been reporting for nearly a decade is a “paper tiger” and that true growth of income and wealth was really nonexistent. It is easy to assume you have new growth, wealth, appreciation when one is able to hide behind false numbers and appear to be in control of risks. But when risks begin to shift into disorderly unwinding, the blinders come off and real problems exist. Now, factor into this equation the incredible risks initiated by the Belt Road Initiative (BRI). The risks of extended debt distress to many foreign nations is complicated by the potential for an extended economic downturn in China. A negative 5~10% economic growth factor in China will create immense pressures on not only China, but most of SE Asia. In addition to this extended pricing and economic pressure, the extension of credit for infrastructure projects within the BRI are already exerting debt repayment pressures on a host of foreign nations. We recently reviewed outside research that confirms our suspicions : https://www.cgdev.org/sites/default/files/examining-debt-implications-belt-and-road-initiative-policy-perspective.pdf. Should inflation continue to rise in China while a credit/debt contraction event unfolds, it would likely result in a Venezuela or Zimbabwe type of outcome which would be difficult to contain. It may result in an incredible humanitarian crisis event where hundreds of millions of people suddenly find themselves unable to maintain any wealth, service their debt and restore any order to their lives. An interesting article focusing on how Venezuela positioned themselves for a perfect storm of hyper-inflation can be found here : https://www.forbes.com/sites/garthfriesen/2018/08/07/the-path-to-hyperinflation-what-happened-to-venezuela/#21a29d3e15e4. The take away from this should be that protectionist mechanisms (a currency peg, import/trade controls, nationalization of industries and state subsidized commodities and industries) setup a perfect storm environment when global supply/demand factors implode. Once we consider the Chinese Consumer Price Index as well as all of these additional factors, traders must be prepared for what may become a 24 to 72 month process of unwinding Chinese credit/debt risks within the global markets. 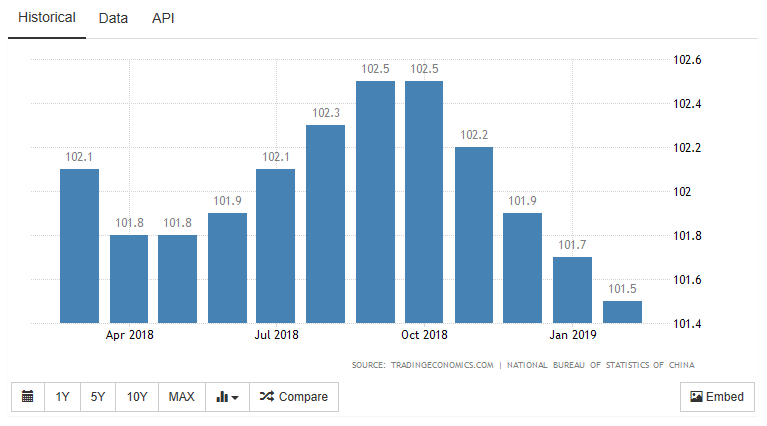 Should CPI continue to fall, but not fall in line with a decrease in the GDP Deflator levels, then we should consider a moderate level of hyper-inflation is taking place in China. 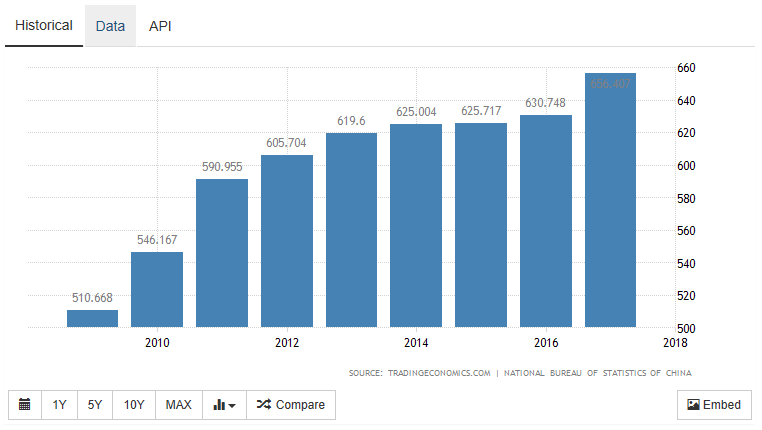 Should exports, employment and GDP begin to collapse while the Chinese government attempts to minimize these factors for the consumers/corporations, then we should consider the Chinese government is following the path of Venezuela in attempting to control risks that are disorderly. The Chinese CPI chart, above, fails to explore the continued consumer pricing level increases that have been in place since well before 1995. Mild contractions do occur throughout this data. We would be concerned with a moderate CPI contraction that lasts longer than 24 months. In particular, we would be concerned with a dramatic shift in the economic growth capabilities of China and their consumer base as that could become a catalyst for a larger contraction event. In the next segment of this research post, we’ll explore how all of this relates to opportunities for traders and show you what we expect to happen over the next 12~24 months. If you want to join a group of professional traders, researchers, and friends, take a look at our trading newsletter to learn how we can help you find and execute better trades each month. We believe 2019 and 2020 will be incredible years for skilled traders and we are executing at the highest level we can to assist our members. We recently close some nice positions UGAZ 30%, NIO 21.6%, ROKU 13%, GDXJ 10.5%. In fact, we are about to launch our newest technology solution to better assist our members in creating future success. In fact, we are about to launch our newest technology solution to better assist our members in creating future success.